Home / Ana Torv / Emmys / FOX / Fringe / John Noble / Joshua Jackson / Why won’t they give John Noble an Emmy? Why won’t they give John Noble an Emmy? My favorite award show, the Emmy’s, is right around the corner. As a TV fanatic I enjoy every minute of it. However year after year, I am disappointed when I hear the nominations and some of my favorites, cough SOA cough, are neglected. Now, I am aware that there are certain types of shows that will never get a nomination. That is the case of the awesome Sci-fi extravaganza that is Fringe. The show is too out there, too obscure and too complicated for Emmy voters to ever pick it among their more snobby choices, especially with only a two episode sample. No matter how much I love it, the show will never get a nod, but couldn’t they at least recognize the superb acting? Which brings me to my eternal question: FOR THE LOVE OF GOD WHY WON’T THEY GIVE JOHN NOBEL AN EMMY??? I really don’t get this one… Besides being in a sci-fi show, he seems to have all the elements that Emmy voters love. Abundant emotional scenes, a fair amount of craziness and he is a renown veteran actor who has been in countless plays and big films like The Lord of the Rings. Voters usually love that kind of thing. Yet, no Emmy-love for Noble. From the minute we were introduced to the ‘other universe’ the cool factor of the show doubled and so did the opportunities for memorable performances. All the actors were great in playing their alternate selves, but none did as masterful job as John. We were waiting for a scene between Walter and Walternate for so long, but when it finally happened it was somehow not what we were expecting. Watching these two men, one so confident and powerful, the other so vulnerable and insecure and yet they are the same man… Walter and Walternate put aside their differences and realize they are united by their fear of losing Peter again. The two characters are so different from each other that I have to keep reminding myself they are played by the same person. It was the ultimate joy to see both Walters interact with each other. Yes, we kind of saw it coming. Peter Bishop died when he was a kid. Peter is not really Peter; he is Peter from the other universe. It doesn’t matter if we knew or if it was a total shock. Seeing Walter at his ‘real’ son’s grave was one of the most emotional moments of the show and it didn’t even had any dialogue. Just Walter lovingly placing the coin on top of the headstone and silently crying for the son he could never get back. This was probably the point where I decided this show had a universe (pun intended) of stories yet to be told. Olivia finds out that Walter and William Bell experimented on her when she was a little girl she confronts Walter in a diner. Olivia was basically abused, experimented on and probably screwed up for life by Walter’s unethical tests. Then why is it that when I watched this I was pissed at Olivia and felt really bad for Walter? 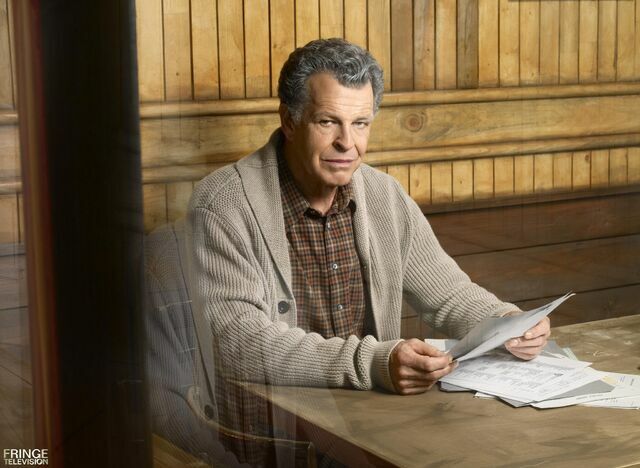 It is because John Noble’s performance conveyed so much vulnerability, sorrow and regret. After Olivia demands “What did you do to me?”, Walter is unable to remember (due to pieces of his brain missing and all that). He is so broken, full of regret and impotence. Another heart-breaking scene that ends with Walter in tears reaching for his son’s hand, looking for some sort of comfort. White Tulip is probably my favorite episode of Fringe. The reason I loved that episode so much is Walter’s speech near the end of the episode. Watching the scientist acknowledge the existence of a greater power with a mixture of sadness, resignation and shame was a beautiful moment. Accepting his actions (taking Peter from the other side) had betrayed the greater being, Walter confesses he has been seeking God’s forgiveness in hope of getting Peter’s forgiveness as well. In a poetic way, it is not God but the scientist (Peck, the time traveler) who gives him absolution in the form of a ‘white tulip’, bringing us back to what he said before: ‘God is science’. The entire sequence was so touching and the emotion with which John Noble delivered the speech almost brought me to tears. Walter goes to Chinatown in order to collect some herb samples for genetic comparisons. He insists on going alone. After a while he gets lost and he is unable to remember Peter’s number. It is one of those moments in Fringe where there isn’t an intergalactic war or telekinetic villains threatening our heroes. It is a simple but heartbreaking scene about a man unable to find his way home, a man, a genius really who has been deprived of his basic capabilities. You’ve got to have a stone heart not to be moved by this. Every single character had a unique introduction in the pilot. From Broyles waltzing into the airfield to Peter walking out of that cab in Iraq, but the most memorable introduction had to be Walter’s at the mental hospital. How can you beat that superb moment when he turns around looks into Olivia’s eyes and says “I knew someone would come… eventually”. The scenes that follow only add to the amazingness of the character. From that moment on right when we were about to be convinced Walter was irreparably lost he had an unexpected moment of lucidity and genius (usually followed by some comment about junk food) and John Noble managed it seamlessly. From the first scene the tone and balance of the character was there, no adjusting necessary, Noble had it from the get go, and that is so rarely found on TV. Finally, someone agrees with me! I've been saying for years that I don't understand why John Noble hasn't won an Emmy for his work on Fringe. It's a sad fact that he will never be rewarded for the great work as Walter.